I have been deer hunting for as far as I can remember . 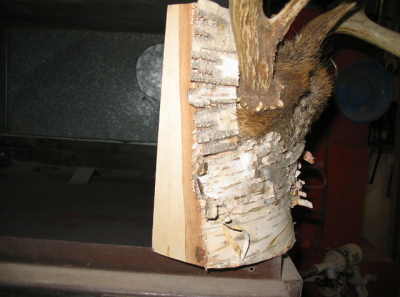 I have also been mounting my own antlers on boards since way back when ..
Today I got an idea , I took a slab and started to put some antlers I had laying around on it . 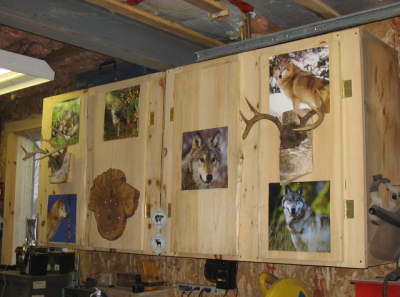 Of course after puting them onto slabs , had to put them up . 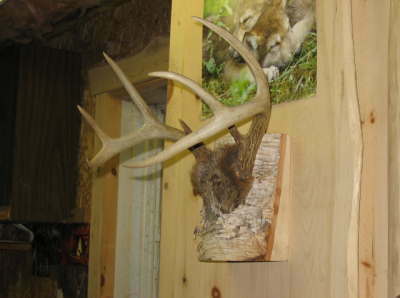 How do you guys that do mount your antlers mount them . I like what you have done. Makes a great rack board. Looks great. This is the last one I mounted. Takes a while to boil the skull and pick it clean. The grandson planted a couple pingpong balls in it for 'eyes' that you can move to get different 'looks' from it. Thats a nice set of antlers , with those eyes you can really get a good stare out of him . Nice work . You guys make me jealous! Those are some nice racks. Down in Florida we don't see many like that. I did not know there where deers in Florida . Got any pics of them . I did not know there where deers in Florida . I've seen them........... but my parent's Greyhound is bigger. Remeinds me of the time a friend of mine went to Pensilvinia for a deer hunt ... the first morning out he did not shoot at anything .. he could not figure out why there where so many faons running around . We've got about 600,000 deer running around Florida (the last estimate I remember). The average buck killed in Fla. is in the 1 1/2 age class and is barely over 100lbs.. However, in some areas with better soils and where the deer get a little age on them, a 200 lb buck is possible. The biggest I've killed was about 220 lbs., 10 pt, with 19" inside spread. This is also the biggest I've seen out of a few thousand I've examined. Our climate, soils, and vegetation tend to produce smaller animals with less bulk. In the Keys (Key west, et al.) there is a sub-species that is in the 50 lb range. Sorry, but no pics on computer. Thanks Mark , I was surprised to see that there are so many deer in Florida .. I will do a little internet search and try to find a pic of those tiny deer in the keys . full grown foans .. they got to be cute . I lived in Key West when I was 10 years old. There was a small tourist attraction on one of the Keys that had a mature buck along with a few other deer in a pen. If I recall correctly he was a ten-pointer and you could cover his whole rack with your hat! These small deer kept the pirates and other ne'r do wells fed in the early years, now their biggest threats are cars, dogs, and well meaning people feeding them "cheetos" and cookies!